If you have a teen around, you probably know the language and can relate to the sentiment. Makes no sense to me. I just get a silly look from Morgan when I try to speak her language. Honestly, I feel a bit silly too….I’ll just stick to putting the sentiments on greetings for her. 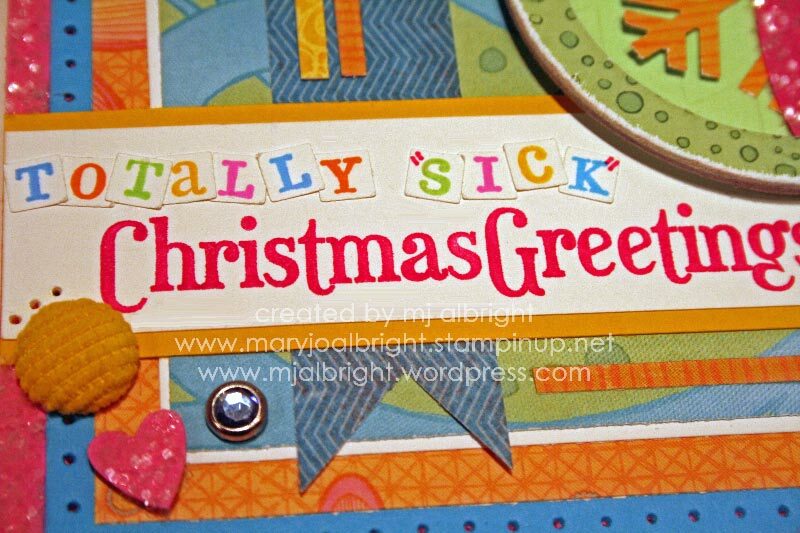 To create my sentiment, I used Calendar Alphabet & Numbers and Grateful Greetings stamp sets on Whisper White cardstock. The sketch has a flower at this location. I made this a circular focal point with some fun elements that I know Morgan will enjoy looking at. Want to see more samples for wsc107? Head on over to see what these talented ladies have created: Beate for sketch and details, Cambria, Charmaine, Jenn, Lori, and Sharon. STAMPS: Calendar Alphabet & Numbers and Grateful Greetings stamp sets. PAPERS: Kaleidoscope, Storybook Specialty, and Autumn Meadows Designer Series Paper; Whisper White, Summer Sun, Tempting Turquoise, Pixie Pink, Pink Passion, and Green Galore cardstock. INKS: Tempting Turquoise, Summer Sun, Pink Passion, Green Galore, Only Orange, and Pixie Pink Classic Stampin’ Pads; Pink Passion Stampin’ Write Marker; Uni-ball Signo White gel pen. ACCESSORIES: Fire and Ice Circle Rhinestone brads; Chunky Essentials Stampin’ Glitter; Summer Sun Corduroy Buttons; On Board Loads of Letters and Lots of Letters; My Way Punch; Jumbo Snowflake Punch; Heart to Heart Punch; Stamp-a-ma-jig Tool; Stampin’ Dimensionals; Big Shot Die-Cut Machine; SU! Backgrounds 1 Texturz Plate; Mat Pack; Paper-piercing tool. Happy Friday. Today I have two cards to share. I KNOW!!!! I got to do some stamping Thursday morning. I liked the sketch so much that I decided to make a Thanksgiving and Christmas greeting. These cards are made for Beate’s wsc105. Hope you can play along this weekend. I love the elegance of this card. I already know the perfect recipient for it. 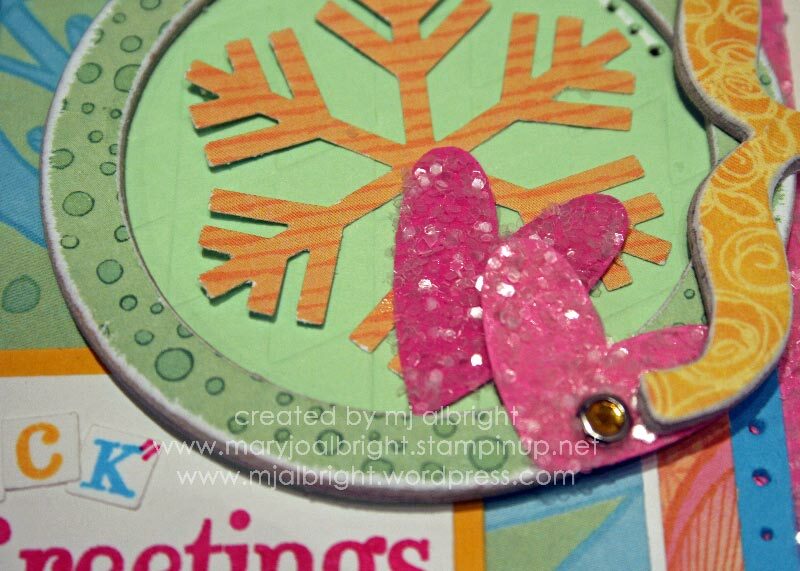 I used Stampin’ Up!’s Serene Snowflakes stamp set on Bella Bleu Designer Series Paper. I used Holiday Best Hostess Level I stamp set for the main sentiment/image. These combinations work so well together. For the focal point, I used a chipboard circle covered in dsp and sanded edges using my sanding block. I applied Sahara Sand ink to the image and used a Chocolate Chip marker to color in the bird. I stamped this on Very Vanilla cardstock and punched out using my 1-3/4″ Circle Punch. I inked up the image again in Sahara Sand ink and stamped on Very Vanilla cardstock. Restamped over the image with the Champagne Shimmer Paint. Stamped a final time using Not Quite Navy ink and cut out just the “Merry Christmas” sentiment box. Cut out my banner sentiment tag and adhered with Mini Glue Dots and a Mini Library Clip. The above picture is an upclose to show you just how elegant the Shimmer Paints are (and a must have in my opinion). This is the first opportunity I have had to play with the paints. I had so much fun…and added a touch of shimmers to my hands, face, and clothes:) Don’t worry! It’s subtle and cleans up so nicely. The next card is for Thanksgiving. I can honestly say that I don’t send out handmade greetings for this holiday…I would if I hosted our family dinner at our home. So, my thoughts are that it’s always good to have a “Give Thanks” card on hand. The colors of this card are just so warming and beautiful together. I changed it up a bit by adding a squared frame to my circle main focal point. Using the same stamp set I used in my Merry Christmas card, Holiday Best Hostess Level I stamp set, I got a totally different style…but just as nice. I used a Chocolate Chip, Really Rust, and Taken With Teal marker to create my sentiment on Very Vanilla cardstock. I sponged the edges with Chocolate Chip ink. I adhered this punched out circle to a piece of patterned paper from Autumn Meadows Designer Series Paper. I simply could have layered this piece onto a larger piece of Chocolate Chip cardstock, but I wanted a frame. So, using a 1/2″ larger in size piece of Chocolate Chip cardstock, I paper-pierced and used an exacto knife to cut out…making my frame (just adds the right amount of dimension to my focal point). Above is un upclose picture of the bottom of my “Give Thanks” card. I continued the theme from the main sentiment focal point to the bottom of the card for balance. Want to see more samples for wsc105? Head on over to see what these talented ladies have created: Beate for details and sketch, Cambria, Charmaine, Jenn, Lori, and Sharon. INKS: Sahara Sand and Chocolate Chip. ACCESSORIES: Champagne Mist Shimmer Paint; Mini Library Clips; Vintage Brads Assortment; Chocolate Chip Taffeta Ribbon; On Board Lots of Letters (circle); 1-3/4″ Circle Punch; Sanding Block. ACCESSORIES: Button Latte Designer Buttons; Fresh Favorites I Colored Buttons; Linen Thread; 1-3/4″ Circle Punch; 3/16″ Corner Rounder Punch; Mat Pack; Paper-Piercing Tool.